It was a chap called Kevin Bird and his partner Sheryl Bowen - Kevin was taking the plunge and setting up his own carpentry business. Simon invited Kevin and Sheryl to Ridgeway Press and they spent an hour or so talking. Ridgeway Press has been trading nearly 30 years, so Simon has plenty of experience to share and understood the clients’ specific marketing objectives. The conversation started with discussions about the proposed name and various key actions regarding incorporating a company, then extended to printing – and what a new company might need. So not just business cards, but stationery too. Soon things moved on to how Ridgeway would create a logo; how they could help with the design, content and hosting of a website; how email addresses could be linked and hosted (including advice about getting the right domain name); how to get van livery completed. Ridgeway was able to help with all of these processes. Within a week of Kevin’s and Sheryl's visit, Ridgeway had designed a logo and the business cards were printed. Kevin has since received several compliments on both the card design and the quality. Within days a web presence was hosted, the domain name was secured and emails were up and running . Within two weeks, the website structure was built and the content was being updated. Throughout this busy time Ridgeway Press kept in constant touch, providing proofs visuals and copy writing content for the website. 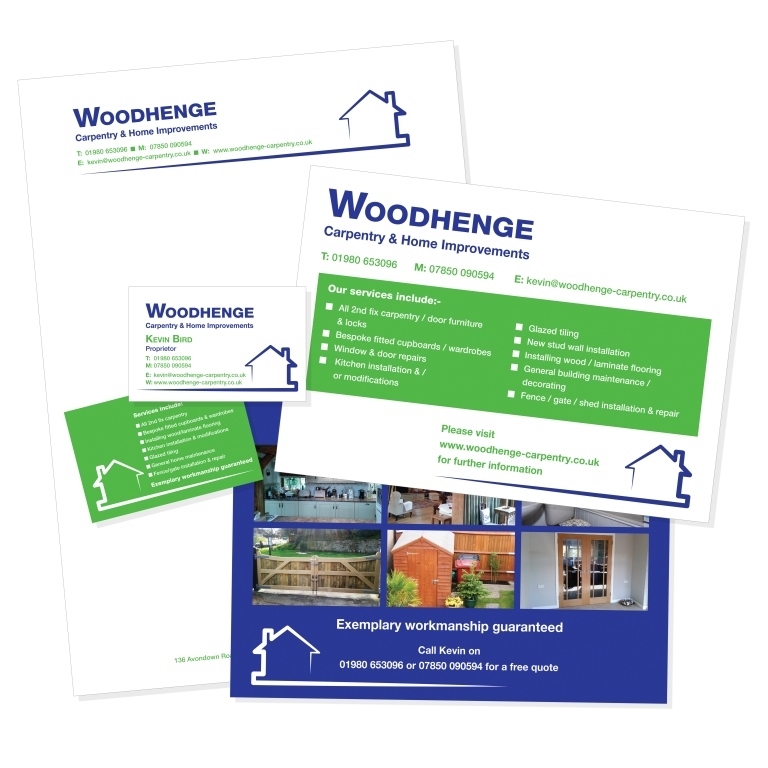 Since then, Ridgeway has also arranged embroidered polo shirts for Woodhenge Carpentry, worked closely with Woodhenge to create a striking van livery and have it applied to the new van, produced leaflets which were distributed through Markets Magazine as well as creating press advertisements for other local media. 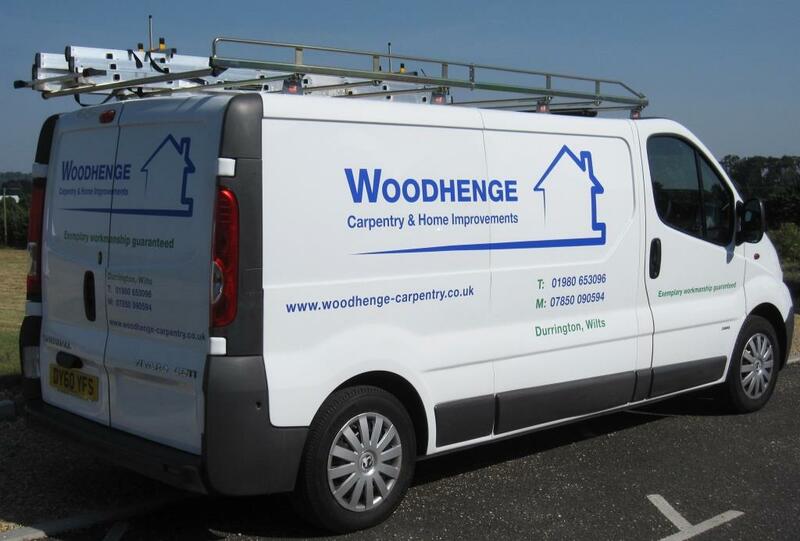 This rapid approach has meant that Woodhenge Carpentry has achieved significant impact from day one of trading and work has been coming in nicely and steadily since, with the first projects for customers already completed. A social media presence is also in the pipeline for Woodhenge Carpentry. Ridgeway Press can do all of this and more for other entrepreneurs, budding traders and new start ups. Or we can use all these skills to give your already established business a freshen up. Just call us on 01256 300420, and drop in for a cuppa. We are near to Easton Royal, east of Pewsey.